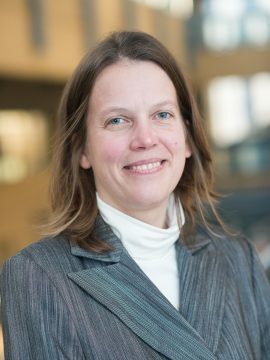 Dr. Christiane Hoppmann is Associate Professor in Health Psychology and Canada Research Chair in Health and Adult Development in the Department of Psychology at the University of British Columbia. She is also a core member of the UBC Center for Hip Health and Mobility. Dr. Hoppmann’s research examines how key psychological factors such as social relationships and goals contribute to the successful mastery of challenges and foster healthy aging. Her projects involve in-depth investigations of everyday processes using novel daily life assessments (‘time-sampling’) and track how such everyday life processes accumulate over time to manifest in long-term health outcomes. Almost all of her research is done collaboratively with different disciplines, local stakeholders and community organizations, and researchers from other Canadian and international universities (e.g. UBC Center for Hip Health and Mobility; Humboldt University of Berlin, Germany; Concordia University, Montreal). Pauly, T., Lay, J., Nater, U., Scott, S. B. & Hoppmann, C. (in press). How we experience being alone: Age differences in affective and biological correlates of momentary solitude.Gerontology. Hoppmann, C., Michalowski, V., & Gerstorf, D. (2016). Spousal interrelations across adulthood: A lifespan psychological perspective on underlying mechanisms. In J. Bookwala (Ed. ), Couple Relationships in Mid and Late Life: Current Perspectives. APA. Hoppmann, C., Lee, J., Ziegelmann, J. P., Graf, P., Khan, K., & Ashe, M. (2015). Precipitation and physical activity in older adults: The moderating role of functional mobility and physical activity intentions. Journals of Gerontology: Psychological Sciences. doi: 10.1093/geronb/gbv107. Hoppmann, C. & Gerstorf, D. (2014). Bio-behavioral pathways underlying spousal health dynamics: Their nature, correlates, and consequences. Gerontology. 60, 458-465. Lay, J. & Hoppmann, C. (2014). Individual and spousal neuroticism: Differential associations with daily affect quality and physical symptoms in old age, Health Psychology, 33, 803-812. Dr. Hoppmann is accepting graduate students through the health psychology program. Learn more.